I guess things were not as chaotic as the press was reporting. Trump’s selection of Jeff Sessions as attorney general on Nov. 18 made him the second-fastest president-elect in recent history to pick a Cabinet nominee. He added another on Nov. 23 with Besty DeVos as education secretary. In the fourth week of the transition, Trump has named five nominees: Rep. Tom Price at the Department of Health and Human Services, Elaine Chao at the Department of Transportation, Steven Mnuchin at the Treasury Department, Wilbur Ross at the Commerce Department, and retired Marine Gen. James Mattis at the Department of Defense. 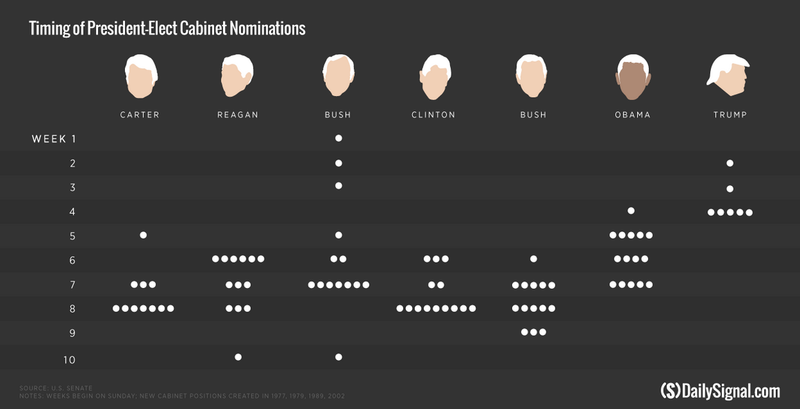 The speed of Trump’s choices is even more surprising given that Bush enjoyed the continuity of Republican government in 1988; two of Bush’s three nominations in November 1988 were holdovers from the Reagan administration. With his selection of Price and Chao, Trump is now the fastest president-elect in 40 years to fill four Cabinet roles. Some of these choices have not met with overwhelming approval from conservatives, but we need to remember a few things. All of these picks have been successful in their areas of expertise. Theoretically, Trump is in charge and will set the agenda. I would like to ask that my conservative friends hold their fire until someone actually does something that impacts some policy. Republicans (and sometimes conservatives) have a gift for forming circular firing squads. Let’s not form one now. Let’s stop adding to the media frenzy. We need to give Donald Trump a chance to make the changes he believes will move the country in the right direction. We may not agree with all of those moves, but the proof of the pudding is in the eating. Take a deep breath, relax, and let’s see what happens next.